Notice: This catalogue page may contain unedited data. DESCRIPTION.- USNM 463101, a wholly septate phosphatic fragment 30 mm long, has compressed whorl section and whorl breadth to height ratio of 0.61. Coiling evolute, with shallow umbilicus, low, feebly convex and subvertical umbilical wall, and narrowly rounded umbilical shoulder. Flanks slightly convex and subparallel with greatest breadth around midflank. Venter narrowly rounded with traces of what appears to be floor of a keel in places. Surface of shell smooth, but for single prominent, broad, markedly biconcave, prorsiradiate constriction projected strongly forward and weakened on venter to form narrowly rounded ventral chevron. Suture has large ventral saddle, narrow-stemmed E/L, and large, bifid, deeply incised L, and bifid L/U, as large as E/L and similarly incised; U, smaller and asymmetrically bifid, remainder of U being strongly retracted. Description: Evolute with low to intermediate expansion rate. The flat umbilicus spans c. 40 per cent of the shell diameter. Approximately one-third of the previous whorl is covered. The flanks are subparallel and slightly convex, with a short vertical wall and narrowly rounded umbilical shoulders. Maximum whorl breadth is at the middle flank. WB/WH decreases with growth due to a gradually compressed whorl section. Three to four deep biconvex constrictions are present per whorl. They are convex on the middle flank and concave and prorsiradiate on the outside to cross the venter in a projected bow. From a diameter of 33 mm onwards a faint keel is preserved on the largest specimen (UANL CE MAAS-063). E is broad and much shallower than the asymmetric trifid L. The umbilical suture line is slightly (early growth stages) to strongly (later growth stages) retracted. Description. - Coiling very evolute with umbilicus comprising up to 37 percent of diameter, with low umbilical wall and nar- rowly rounded shoulder. Whorls expand slowly; composite molds smooth, but for distant narrow constrictions, four or five per whorl. These are feebly prorsiradiate, concave on inner flank, convex at mid-flank, and concave on outer flank, projecting strongly forwards on ventrolateral shoulder. Strong siphonal keel. Sutures not seen. TYPES.- The lectotype is BMNH C5 1024, the original of Forbes, 1846, plate 7, figure 3, by the subsequent designation of Matsumoto and Obata, 1955, page 145; paralectotypes are BMNH C5 1023 and '251025, from the Valudavur Formation of Pondicheny, South India. Material.- A single specimen, USNM 463101. DISCUSSION.- The markedly biconcave constrictions distinguish Hauericeras rembda from all other species referred to the genus. A full revision of this species and a detailed discussion of differences from its allies is given by Kennedy and Henderson (1992a), to which the reader is referred. OCCURRENCE.- Upper Maastrichtian of South India and the Biscay region of Spain; Maastrichtian of Madagascar and Zululand (South Africa). The present specimen is from the Prairie Bluff Chalk at locality 34. Remarks: Hauericeras rembda is more involute than H.fayoli (de Grossouvre, 1894) (for comparison, see Kennedy 1986c). Kennedy and Henderson (l992b) showed that H. rembda has a keel from a diameter of 20 mm onwards. In our material the keel appears only on our largest specimen at a diameter of 33 mm. The Cerralvo specimens displayajuvenile suture line which is less complex even for the largest specimen than the suture line described by Kennedy and Henderson (l992b). Occurrence: Hauericeras rembda (Forbes) is known from Japan (Matsumoto and Obata 1955), tbe Gansserina gansseri Zone in tbe Biscay region (Ward and Kennedy 1993), tbe Upper Maastrichtian of the Valudavur Formation in soutbern India (Kennedy and Henderson 1992b), and the Maastrichtian of Madagascar (Collignon 1971). A single fragment has been recorded from tbe Maastrichtian of Alabama (Cobban and Kennedy 1995). Types.- Lectotype, by the subsequent designation of Matsumoto and Obata (1 955, p. 145), is BMNH C5 1024, the original of Forbes 1846 (Pl. 7, fig. 3), paralectotypes are BMNH C5 1023 and C5 1025. The figured syntype of Ammonites Durga Forbes, 1846 (p. 104, Pl. 7, fig. 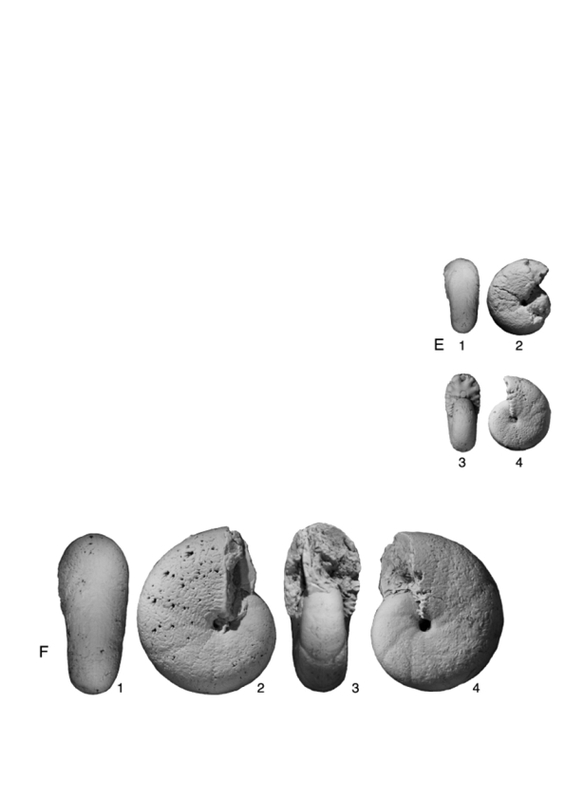 1 1) is BMNH C5 102 1, all from the Valudavur Formation of Pondicheny, south India (ex Kaye and Cunliffe Collection). BMNH (23567 is a topotype. Discussion. - As noted by Kossmat (1 898), Ammonites Durga of Forbes represents the early growth stages of Hauericeras rembda, prior to development of the keel. This is well illustrated by the largest paralectotype, BMNH C51023, which shows the beginning of a keel developing at 20 mm. The syntypes of durga, BMNH C5 1021 and 5 1022, are both less than 20 mm diameter. Hauericeras rembda most closely resembles Hauericeras fayoli de Grossouvre, 1894 (p. 220 (pars), Pl. 27, fig. 3), which is probably from Tercis, Landes, France, and probably of late Campanian age (see revisions in Kennedy and Summesberger, 1984, p. 157, Pl. 1, figs. 8, 12, Pl. 2 figs. 4, 13, 5, and Kennedy, 1986a, p. 27, text-fig. 9a-j). But this species is much more evolute, with U = 45 percent, and constrictions that are sinuous rather than biconvex. The Maastrichtian H. sulcatum (Kner, 1848) (p. 8, Pl. 1, fig. 3; see revision in Kennedy and Summesberger, 1987, p. 27, Pl. 1 figs. 1-7, Pl. 13, fig. 2) has 6-7 prorsiradiate constrictions per whorl that are concave, rather than biconvex. 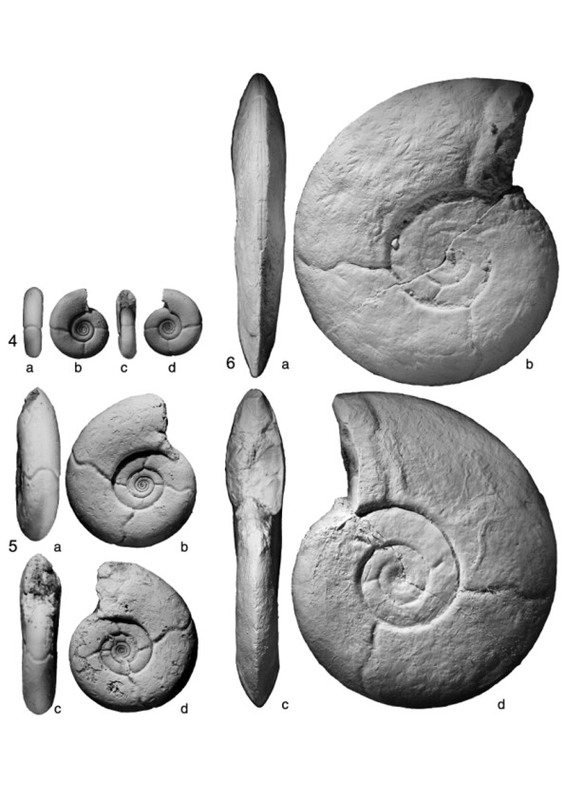 Occurrence.- Maastrichtian of south India; in the Biscay sections this taxon is rare and short ranging; it has been found only over a narrow stratigraphic interval near the top of Member I (lower Maastrichtian). Etudes de paleontologie tunisienne I: Cephalopodes des terrains secondaires.